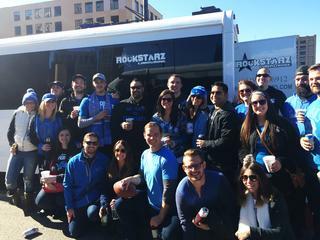 For anybody that resides in the Canton, MI area and who is wondering where to hold their celebration, then can we suggest you consider a party bus in Canton? Here at Rockstarz Limousine and Party Bus, we specialize in providing our clients with a wonderful space to hold their celebrations, and you are guaranteed to have an amazing time with us. When you are looking to rent a party bus, there are a number of key things to take into consideration, but we can assure you that we have all of the basics covered. From providing you with ample space for you and your guests to party, to the comfortable leather seats that offer you a place to just relax and chill for a moment, this is a bus that is unlike any other. Our Canton party bus service will include you having a professional driver who will take care of all of your needs. In addition, it gives you access to your own private nightclub that comes complete with a stunning sound system to elevate your music to another level as well as a laser light display to simply provide you with some extra atmosphere. When it comes to our Canton party bus rental, there are various reasons as to why individuals decide to hold their celebrations on our bus. From those special birthday occasions to anniversaries, even to bachelor or bachelorette parties, the reason is entirely up to you as we will focus on providing you with the location. Any individual in the Canton area that is indeed looking for a party bus to rent should give us a call here at Rockstarz Limousine and Party Bus as soon as possible. Alternatively, you are able to contact us via the form on our website and a member of our team will be in touch with you as soon as possible.